Two weeks ago today, I walked into work determined to make it a better week than the previous one. It was “do over week.” That evening, as I was on a run after work, I got a phone call that stopped me in my tracks, and I knew do over week was over and the days that followed would be very different than I imagined. Two weeks ago today, we lost a family member all too soon. 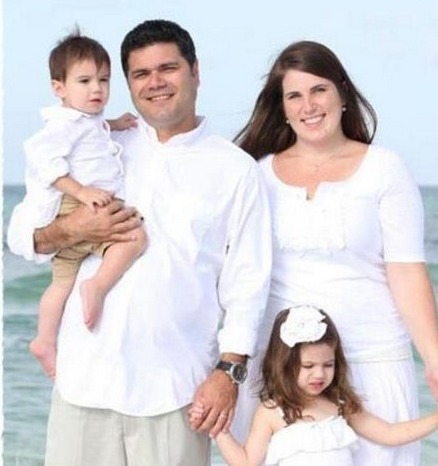 My cousin Ryan and his wife Amber were in a car on the highway in Texas on one of his business trips, when a freak accident happened and took Amber’s life. She was 31 years old. As my mom relayed the news to me over the phone three thousand miles away, I knew that both of us wanted nothing more than to hop on a plane that second and head to Louisiana to be with our family. Then and there, all I could do was head back to the office, get my bags, and head home. I knew then and there that if Mom couldn’t make the trip, that I would represent and go to our family. Family comes first. Work, friends, anything else…it was all a blur for the next three days until I was on an airplane back home. I have a huge extended family. Ryan is one of my twenty-two cousins, and his father, my uncle Timmy, is one of my favorite people in the whole world. Although I had only met Amber a couple of times, and unfortunately was unable to make her and Ryan’s wedding several years ago, as a Roussel, I knew that just being there to hug my family and show my support was enough. In our family, no matter how big we get, no matter what is going on, we step up, and we show up. Mom ended up not going, because just a few days later she was headed to Houston to be with my aunt, who is being treated for cancer at a hospital there. She was showing up there, I was showing up for the rest of the family. That’s what we do. There were countless moments over that week as I anxiously awaited to be with my family, and throughout the weekend I spent at home that reminded me just how important it is to treasure each moment that we have, and each relationship we have built. My colleagues and closest friends texted, emailed, tweeted, prayed, and called me with their condolences and thoughts. People in the nonprofit sector that I know a little but not that well reached out, and it warmed my heart. My cousins stepped up and split time with Ryan each night of that first week, helping him with his and Amber’s two small children, Emmie Claire and Baby Ryan. My aunts and uncles offered to cook and to babysit and numerous other services. It seemed like the entire state of Louisiana was expressing their sympathies and good memories on Ryan’s and Amber’s Facebook walls. And best of all, Amber’s network of online friends and mothers, created a memorial fund for her that has now raised nearly $55,000 with 30 hours left. The initial goal? $3,000. That’s the power of social media, and that’s the power of love. People showed up. So why not hug tight every day, and say I love you every time? My visit home brought back so many great memories of time spent with my family doing what we do best: laughing, eating, and loving. I don’t get down there that often anymore, and as we’ve grown older, it’s gotten harder for us to all gather in the way we used to on Sunday afternoons at MaMa and PaPa’s after church, or on a humid summer night at the camp, eating boiled crabs and swimming in the swamp under the moonlight. But there’s no reason why it can’t happen. Instead of “remember when…” what if we said, “Next time…” Instead of “I can’t make it,” how about “I’ll be there.” Instead of “It’s been too long,” how about “Good to see you again so soon!” As the priest said at Amber’s funeral, we need each other not just today, or tomorrow, or next week. But we need each other in the months ahead, and the years to come. It’s easy to say we’ll do better, and be nicer, and make it work in times of sadness or crisis, and then let life catch us again and next thing you know, it’s too late again. Maybe a visit in person isn’t always feasible, but in this world of technology at our fingertips, it’s a text, or a Facebook message, or a tweet. It’s a “I’m thinking of you,” or “Hope you’re well.” It’s the difference between showing up and missing out. Which will you choose? Many of my loved ones passed away when I was younger and those experiences have dictated how I express love and appreciation to those around me. I am entirely too paranoid to let any one leave my sight after a fight. Maybe it’s made me a little neurotic but I’d rather that than sorry. Which reminds me… I gotta get home to NJ soon. It’s ALL SO TRUE and how many times we miss an opportunity GOD gives us??? Because it’s easy to “blend in”, “go with the flow” !!!!! We need to realize that nothing is more uplifting and heart warming than a simple hug from a loved one to show our love!!!! We need to go against the grain and be different sometimes…. Don’t have an attitude of ” she knows I love her by now.”Like this letter said………. We don’t know when our last hug, kiss, etc……will be!!!! Why not today????? Great letter Brad!!!! Hope it opens some eyes and hearts!!!!! I didn’t write the letter. My cousin Jenna Sauber wrote the letter. All the credit goes to her. Jenna, I’m your Aunt Linda’s first cousin, Ruth Folse Hirsch. What a delightful, heartwarming story of love shared by your family. 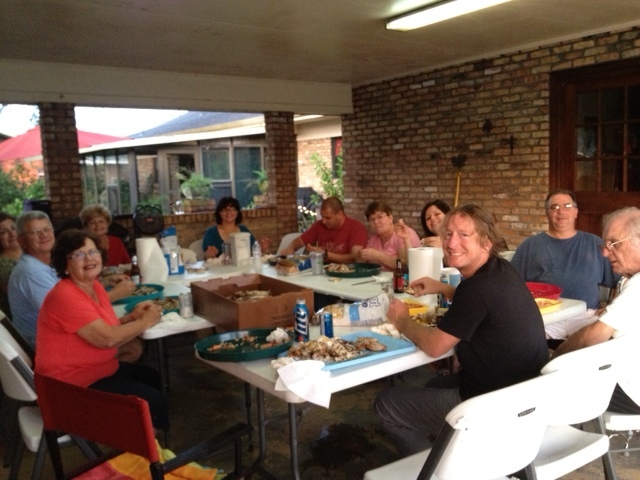 Many wonderful, nostalgic memories were evoked in me as I relived the Sunday afternoons spent with my Aunts and Uncles and about 30 first cousins, either at our Grandparents home, kids playing in the yard, or as you described, at the camp eating boiled crabs, crawfish, or barbequed something or other. Adults and youth alike playing volleyball, baseball or just getting to know one another intimately. How sad that families of today miss out on so much of the joys and impromptu get togethers of days gone by. Thank you for sharing such a beautiful, heartfelt, almost sacred part of your life. Thank you so much for reading and commenting! I’m glad the post was able to bring back some happy memories for you as well. Very well said and done. I enjoyed the short amount of time we spent with you on your trip to Louisiana. Thanks for taking the time to spend the night at the house with my family. I love you and hope to hear from you or see you again soon.